DHAKA: India and Bangladesh on Tuesday resolved a long-standing border problem, signing a historic agreement on demarcation of land boundary and exchange of 162 adversely- held enclaves, but their failure to sign any deal on sharing of Teesta and Feni river waters cast a shadow on Prime Minister Manmohan Singh’s maiden visit here. Both the countries on Tuesday night signed a number of agreements, protocols and memorandum of understanding (MoU) including on the vexed boundary demarcation in a bid to enhance bilateral ties between the two neighbours. As per the agreement pertaining to controversial Pyrdiwah/Padua area, which had witnessed violent clashes in the past, it was decided that the Meghalaya villagers will be allowed to draw water from Pouamng river, which has been a bone of contention. The boundary line shall be drawn from existing pillar as per joint survey and mutually agreed principle. Similarly, in case of another flash point area Muktapur/Dibiri Hawor area, it was agreed that the Indian nationals will be allowed to draw water and exercise fishing rights in the water bodies from the Muktapur bank side. The villagers will also be allowed to visit the Kali temple on the other side of the border. In case of another busy but controversial area — Dawki/Tamabil, it was agreed draw a straight line joining existing boundary pillars and it was also agreed by both parties to erect fence on the zero line in the area. The agreement reached in other disputed areas were-Lyngkhat, Lobachera and Naljuri. However, Dr Singh who met his Bangladeshi counterpart Sheikh Hasina, said the two countries had decided to continue discussions to reach “a mutually acceptable, fair and amicable arrangement for the sharing of the Teesta waters”. Seeking to placate Dhaka, upset over the last-minute scrapping of the Teesta water-sharing pact, Dr Singh announced a major trade sop allowing duty-free access with immediate effect to 61 items from Bangladesh to Indian market and permitting 24-hour access to Bangladeshis through Tin Bigha corridor. Of the 61 items, 46 are textile products for which Bangladesh had sought access into the Indian market. Aware of Bangladesh’s sensitivities over the failure to reach an interim agreement on Teesta, Dr Singh said “our common rivers need not be sources of discord, but can become the harbingers of prosperity to both our countries”. The two sides were scheduled to sign an agreement on water sharing during Singh’s two-day visit, but strong objections by West Bengal Chief Minister Mamata Banerjee over the draft of the agreement, led India to back off at the last minute. Bangladesh Foreign Minister Dipu Moni and her Indian counterpart SM Krishna signed the protocol on boundary agreement and the MoU on renewable energy on behalf of their respective sides. Bangladesh Commerce Secretary Ghulam Hossain and Indian Foreign Secretary Ranjan Mathai signed the addendum. Mathai and Bangladesh Environment and Forests Secretary Mesbahul Alam inked two MoUs on conservation of the Sundarbans and Conservation of Royal Bengal Tigers. A MoU was also singed for extending cooperation between Dhaka University and Jawaharlal Nehru University while another to exchange programmes by BTV and Doordarshan. Another MoU was inked to extend cooperation between Bangladesh Institute of Fashion Technology and Indian Institute of Fashion Technology. The governing body president of the Bangladeshi institution and the director general of the Indian institution signed the deal on behalf of their respective sides. Earlier in the day, the two leaders (Dr Singh and Sheikh Hasina) had a tete-a-tete for around 45 minutes. On the concluding day of his two-day visit on Wednesday, Dr Singh will deliver a talk on “India, Bangladesh and South Asia” at the Senate Bhaban of Dhaka University. He will also go to Bangabhaban to visit President Zillur Rahman. Earlier in the morning, the Bangladesh premier received her Indian counterpart on his arrival at the Shahjalal International Airport. 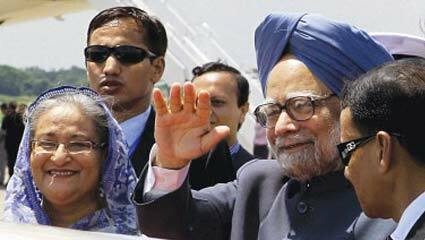 Dr Singh’s much-hyped visit, first by an Indian Prime Minister in 12 years, has already attracted attention from across the globe. The 136-member strong Indian delegation comprises chief ministers of Meghalaya, Assam, Tripura and Mizoram.